Today marked the unveiling of an historic piece of art in Hull City Centre. The (approximately) 250 square foot mural has been restored by local paint manufacturer Teal & Mackrill Ltd and has just been mounted on the side of the company’s new factory extension on Lockwood Street. The artwork formed the main back drop at the 1949 Hull Industries Exhibition and was designed and painted by local artist Patricia Field, the mother of Teal & Mackrill Ltd MD Geoff Mackrill. 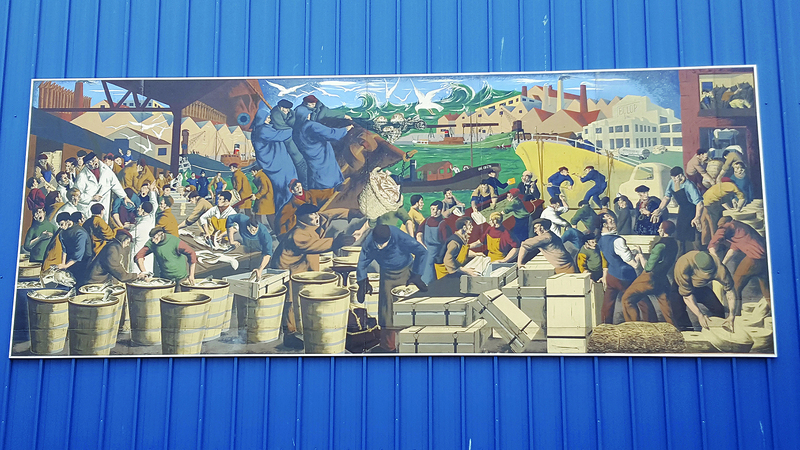 The mural was designed as a vivid portrayal of the activities and environment of the fishing industry and its passage from sea to consumption. The images are based on Field’s visions following groundwork research at St. Andrew’s Dock, Hull. Painted on three-ply wood, the mural took a month for the artist to execute. The fishing industry within Hull formed a large part of the Teal & Mackrill Ltd. business as well as that of the city. The Teamac paint brand is still well known and respected in the fishing industry. The important mural has been protected with the firm’s own product WB101 Anti-graffiti Coating so that it can be preserved and viewed for many years to come. The restoration comes as an independent initiative for the 2017 Hull City of Culture, and will be displayed throughout the year and beyond. As well as this, during the City of Culture Year, schools and other educational groups will be invited to visit as part of learning more about the local fishing heritage and also take part in a colouring competition. Prizes will be offered for the best representations of the mural on two levels: those drawn from scratch and for younger children, those colouring in an ‘empty’ mural. Despite its relevance to the 2017 celebrations, it has been unveiled this week as a personal gesture from son to mother as the artist Patricia Field turns 90 this weekend.